This is a response to a popular article that was posted a few years ago on the blog, For The Record. FTR is a site associated with the online game war of tanks. They make frequent posts that circle around the game and its setting: Tank combat during the 30s to 60s. The quality of these articles vary wildly depending on the topic in question. They are of respectable quality until it comes to WW2, in which case FTR delves into full on historical revisionism. 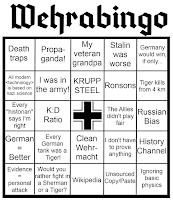 Among other things, they are strongly opposed to the theory that the German army was a uniquely powerful and competent military force. 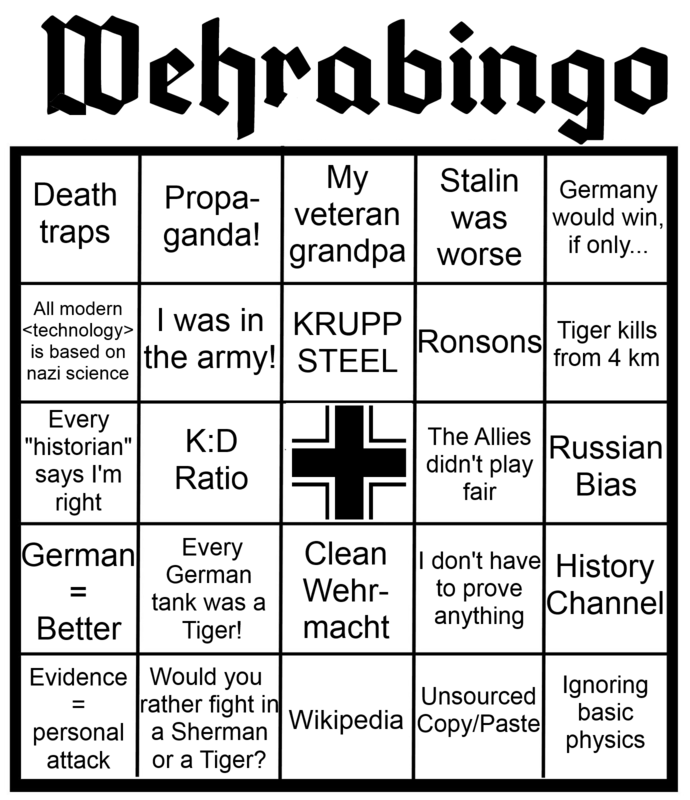 Any individual who makes that claim is shouted down and decried as a Wehraboo. Unfortunately for FTR, this theory happens to be supported by all the known facts about the Heers organisation, and from their performance against opposing armys during WW2. The usual consensus among historians is that the Germans were simply overwhelmed by the burden of fighting against three huge empires, and the superior industrial resources they could muster. One of the authors at the blog (EnsignExpendible) decided that he'd finally had enough with this theory. He proceeded to write a misleading article that trys to dispute the Heers superiority in weaponry and tactics. This is the post that we will dismantle today. In keeping with the 'war of tanks' theme, the author has most of his criticisms focused on armored warfare. The Ensign was wise to choose a narrow subject that played to his strengths, but even then, he falls well short of managing to do a proper debunking. Normally, this kind of biased opinion piece wouldn't even warrant a response. But since it is being promoted on revisionist forums like ShitWehraboosSay, it has now become a worthwhile effort to debunk this article. To be sure, the Ensign is clearly a lightweight without much understanding of warfare in general. Most of his points are forced, and rely on pairwise comparisons of equipment (17 pounder guns vs Tiger tanks, for example). Worse yet, he relys very heavily on websites like TankArchives for sources. The site in question is run by a Russian blogger who makes a career out of translating Soviet field reports from the war, and using them to make deceptive claims... Much like EnsignExpendible himself does. Could there be a connection between these two individuals? Heres another fun fact: In order for a tank to catch fire, its armor has to actually be pierced. Its true that the Shermans weren't any more fire-prone than the German tanks they faced. But the problem is, its armor was pierced much more frequently than the opposition. In one study, 95% of Shermans hit by 75mm or 88mm guns were penetrated, and of those tanks, 65% were burned out. We can safely conclude that its armor was too thin to keep out enemy shells, therefore. Thats one of the reasons why the Sherman acquired a bad reputation after the war. On the other hand, the crews had a pretty good chance of escaping their vehicle alive if it was struck. The roomy interior, spring loaded hatches, ductile armor, and (later) wet ammo stowage were responsible for this. 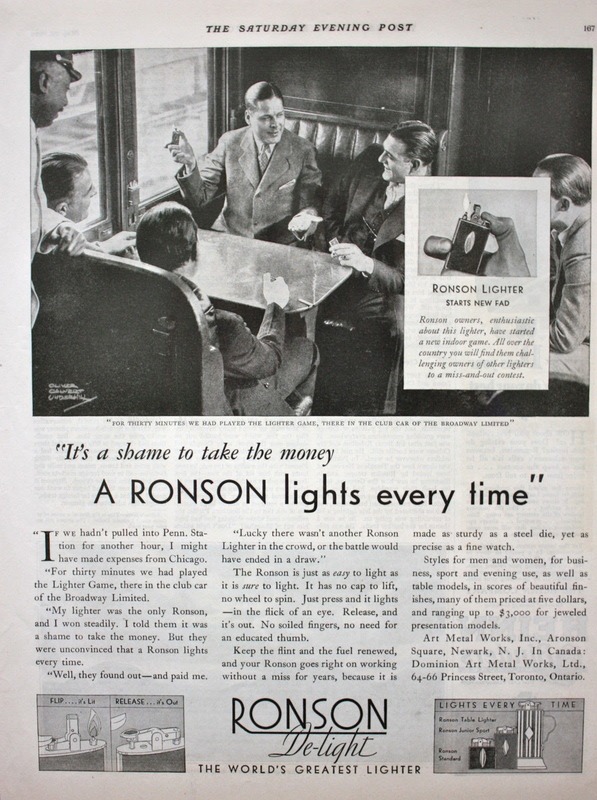 Fact: The Ronson nickname is attributed to the slogan “lights every time”. The slogan was launched post-war, and thus could not influence the nickname. Myth: German tanks in general, and Tigers in particular, were impervious to Allied guns. Fact: Tigers were vulnerable to even Shermans armed with 75 mm guns. The longer 76 mm gun (superior in AP performance to the Soviet 85 mm gun, which could handle Tigers just fine) had no problem with Tigers or Panthers. Thats nonsense. The 75mm M3 gun used by the Sherman was completely useless against the Tigers frontal armor, and was unable to penetrate it even from point blank range. This is made clear from the data about the armor and gun in question, and is also borne out by countless testimonys from veterans and field reports. In combat, the Shermans 75mm gun was only useful against the Tigers side armor. As for the 76mm M1 gun, while this was certainly a better weapon, it was far from ideal. With standard ammunition, it could only penetrate the Tigers mantlet from 100 meters, and the glacis from 400 meters. The 76mm gun was unable to pierce the Panthers glacis from any range at all, and could only penetrate the mantlet from about 200 meters. So where do you get off saying that the 76mm gun had no problem with the German 'cats'? The enemy tanks were able to knock them out from much longer range than vice versa! Your claims about Soviet tank guns are equally facile. While the theoretical performance of the 85mm S53 gun was at least equal to the 76mm gun, in practise, it was hampered by the choice of ammunition. Like most Soviet guns, they used uncapped shells with a soft and brittle nose. As a result, they had a bad tendency to break up against tank armor. German tests reveal that the 85mm guns could only pierce the Tigers turret (not mantlet) from 500 meters, and the glacis from 300 meters. In contrast, the 88mm KWK 36 gun could pierce the T-34/85s armor from a much longer range. So really, your examples only confirm how much of a disadvantage the allies were at in these tank on tank duels. There was obviously a reason why they needed numerical superiority to win battles. Myth: German tanks and crews were superior to anything the Allies had, and achieved an X:1 kill to death ratio (the number varies greatly). Fact: The flaws of German kill counts are covered in detail here and here. The first source you listed is a rant about nothing. Since when does a different method of counting losses qualify as 'flawed' or 'cheating'? A German panzer unit would keep damaged vehicles on the unit list and report a reduced operational readiness rate. An American or British tank unit would have damaged vehicles stricken from the unit list and replaced with new vehicles. So the only real difference here is that the Nazis were simply less willing to send damaged vehicles back to army level workshops. As one source put it:“German commanders were loath to write off panzers and instead carried them on their books ad infinitum, wary of sending them back to the homeland for fear they would never be replaced. As a result, dead vehicles would be dragged forward during an attack, and dragged backward during a retreat.”  And with regards to the panzers overclaiming the number of kills they scored, this is hardly something unique to the Germans. This was observed in all armies of the period, including the Americans, British, and Soviets. The reason is simple: Not all tanks that were hit or even knocked out were so badly damaged that they had to be written off. Some of them could be repaired, and returned to service. Myth: Soviet optics were abysmal, and their guns inaccurate, to the point where they could not engage enemy targets at more than a few hundred meters. Myth: The T-34 was a very unreliable tank, as proven by trials at Aberdeen. Fact: While trials at Aberdeen uncovered some flaws in early T-34 tanks, the tank sent to them was an obsolete model that went through major refurbishment. Furthermore, American testing was flawed (for example, they failed to oil up the air filter). Read more details here and here. Thats only half true, Ensign. From all indications, the tank tested at Aberdeen in 1942 was ''specially prepared using the highest quality parts at the Ural Tank Factory (UTZ), which at that time produced the best T-34s in Russia.'' So any automotive flaws encountered with the vehicle are inherent to its very design. We know that the early T-34 tanks had major problems with their transmissions and final drives. One source states that they would require maintenance after a journey of 50 to 80 kilometers. Another claims that the T-34 could not travel more than 200 kilometers without an overhaul. A disappointing performance, to be sure. According to the Aberdeen report: ''On the T-34 the transmission is also very poor. When it was being operated, the cogs completely fell to pieces. A chemical analysis of the cogs on the cogwheels showed that their thermal treatment is very poor and does not in any way meet American standards for such mechanisms.'' These reliability problems were not fixed until 1943, when the tanks received a better clutch and transmission. Myth: The King Tiger could not be penetrated by any tank gun. Fact: The Tiger II was penetrated many times by various weapons in trials. Even the meek 85 mm gun on the T-34-85 was capable of dealing a fatal blow to it at 300 meters. You know what the difference between trials and combat is? The difference is, the 'target' isn't moving around and shooting back at you. The kubinka test you're so eager to mention involved the vehicle being fired at (in sequence) by 122mm guns, 152mm guns, 100mm guns, and 85mm guns. The armor package was already compromised by the time the 85mm gun got its turn, so that part of the test is invalid. Just look at the firing tests against the glacis plate! The first sequence was done with the 122mm A-19 gun. Most of the shells fired at the Tiger II failed to pierce the glacis plate: They only caused spalling and burst weld seams. The second sequence was done with the 152mm ML-20 gun. None of the shells fired at the Tiger II managed to pierce the glacis plate. Even from 100 meters, they could only burst weld seams and spall the armor. The third sequence was done with the BS-3 gun. The 100mm shells only managed to penetrate when they hit weakened portions of the glacis, or the connections between the upper and lower front plates. This is a trial weighted heavily in favor of the Soviet guns, and they aren't even doing that good of a job. Out of those three guns, the only one that could make a clean penetration was the 122mm A-19, and only when using a specially designed shell that came into service in 1945! It pierced the glacis at 600 meters, but only made a dent at 700 meters. Smaller caliber guns had no hope of dealing with the vehicle from a frontal aspect. Think about it, Ensign. The 85mm gun struggled to knock out even the Tiger I. When firing from an angle of 30 degrees, it could only penetrate the Tiger Is turret from 500 meters, and the glacis plate from 300 meters. So what could possibly lead you to believe that this same gun could pierce the much thicker armor of the Tiger II from the same range? They were the heaviest, best armored tanks ever to enter service during world war 2. The kubinka test bears this out in full. Myth: Germans had the best optics in the entire war. Fact: Not really, just some minor advantages in sight form factors (and not glass quality, like is often said). Daigensui explores the topic here. Minor advantages? Your own link acknowledges that the German optics have a wider field of view (FOV) than American optics of the same magnification. The TZF 5f sight used by the Panzer IV had a 25 degree FOV at 2.5x power, while the TZF 9c used by the Tiger had a 28 degree FOV at 2.5x power. In contrast, the sight used by the Sherman had only a 13 degree FOV at 3x power. Thats a fairly substantial difference, Ensign. The telescopic sights on the Tiger or Panther tanks also had adjustable magnifications, meaning they could go from 2.5x power to 5x power. This, along with their stadiametric notches, gave the Germans a notable edge in long range gunnery. Don't forget, the tank that strikes its target first will usually win the engagement! And despite your claims to the contrary, the panzer optics did indeed posses higher glass quality. A French army report stated: ''The clarity and ranging reticles of the periscope gun sight was excellent and more effective than of the allied counterpart, the Sherman.'' During the interwar years, Zeiss had developed a coating method that enabled a higher level of optical clarity than any other manufacturer. Myth: Germans could knock out Allied tanks at great ranges, and routinely did so from distances as great as 2 kilometers or even greater. Fact: Research indicates that the average engagement range was only several hundred meters. Shots from over 1 kilometer were either rarely taken, or rarely reached their target. The article you link to mentions a study by P. S. Igumnov. This survey was about Soviet tanks destroyed on the eastern front, where the line of sight (LOS) is longer than anywhere in europe. But the article doesn't elaborate on what year this study was conducted, or what the sample size was. Did Igumnov survey 200 Soviet tanks, or 2000 of them? These questions matter. Your own table states that the 88mm guns were scoring kills at longer range than the 75mm guns. The 88s were getting 31.2% of their hits at 600-800 meters, and 13.5% of their hits at 800-1000 meters. The 75s were getting 33.5% of their hits at 400-600 meters, and 14.5% of their hits at 600-800 meters. Anyway, its a well known fact that German guns COULD knock out Soviet tanks from great ranges. The T-34s were shockingly vulnerable to the 88mm flak gun, which was later adapted for use in the Tiger I. In October 1943, a tank commander named Kurt Knispel knocked out a T-34 tank from 3000 meters, the longest range tank kill of the war. But of course, these kinds of shots were the exception rather than the rule. Even in the steppes of russia and the ukraine, most kills were made at considerably shorter range. Myth: The Panther was a great tank that could have turned the tide of the war if only _________. Fact: Panthers, even the latest models, were full of mechanical issues, such as final drives that lasted 150 kilometers. The_Chieftain goes over them here. Additionally, the armour was of exceptionally poor quality, cracking after non-penetrating hits. Gee, do you think? World war 2 was the largest conflict in human history. The chain of events were far too complex to be decided by a single line of vehicles, no matter how impressive their performance may appear to be. While its true that the Panthers had issue with their final drives (as the early models of T-34 did), the sheer extent of this problem has often been exaggerated. The french experience of the tanks only going 150 km before a break down needs to be tempered with the reality that those crews weren't trained to properly operate the Panther. They had a bad habit of keeping the tank in 3rd gear during long marchs, and then controlling the speed using only the accelerator rather than shifting to the higher gears. This is something that German crews had been explicitly warned not to do, as it would lead to premature stripping of the cogs. The 3rd gear was under-designed because it wasn't meant to spend much time in that position: It was only meant to be a transition to the higher gears. But even so, the notion of the Panthers final drives having a 'fatigue life of only 150 km' is bizarre and anomalous. The German manuals don't say anything about them having such a short time between overhauls. And in fact, there are numerous incidents where this figure was exceeded by a long shot. The 11th panzer division was engaged in heavy fighting from August 1944 onward. * They attempted to contain the allied landing in southern France, and conducted several long road marchs. By regulation, the Panther tanks required an overhaul after 800 km. But due to the frantic combat and constant retreats, the 11th panzer division was unable to stick to regulations. By the time September 1944 rolled around, some of the Panthers had over 1500 km on their odometers! They operated over a distance ten times greater than the French claimed was possible. And that isn't all. The British actually did tests on a captured Panther tank which had 500 miles (800 km) on it. The vehicle was worn out, and needed repairs to the engine and steering. Afterwards, however, it was able to successfully pass an obstacle course that both the Sherman and Cromwell failed. It was then put through two additional trials, which is when the transmission finally broke down. That means it traveled five times further than the French claimed was possible. This is not to say that the final drives were not a weak point, its just that the problem has been blown completely out of proportion. Repairing the Panzers: German Tank Maintenance in World War, by Lukas Friedli. *The 11th Panzer division would have had 79 Panthers and 81 Panzer IVs, for a total establishment of 160 tanks.